I’m continuing to post, in serialize fashion, the rough pages, along with the final printed pages (and the original if I have them) to my three issue run on Batman Adventures. Today we’ll look at page1 of Batman Adventures #6, published by DC Comics in March 1993. 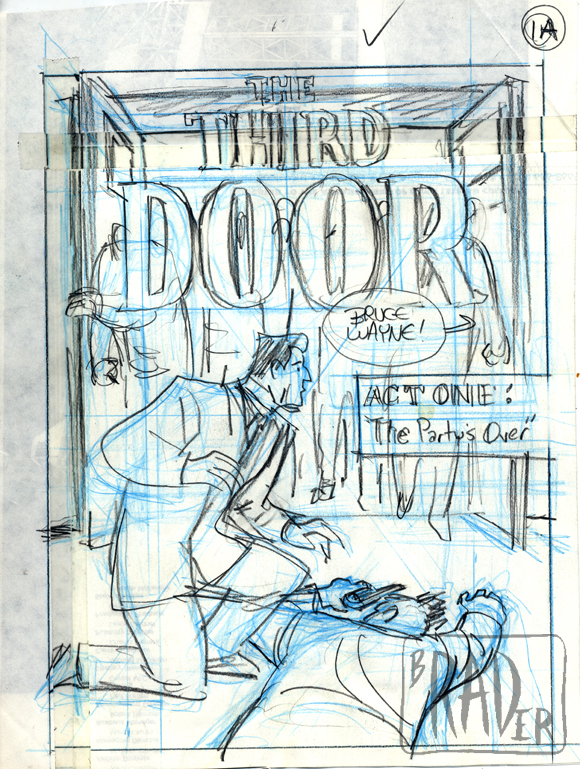 The Story is called “The Third Door”, and it’s written by Kelly Puckett, pencilled by me, inked by Rick Burchett, Colored by Rick Taylor, lettered by Tim Harkins and edited by Scott Peterson. 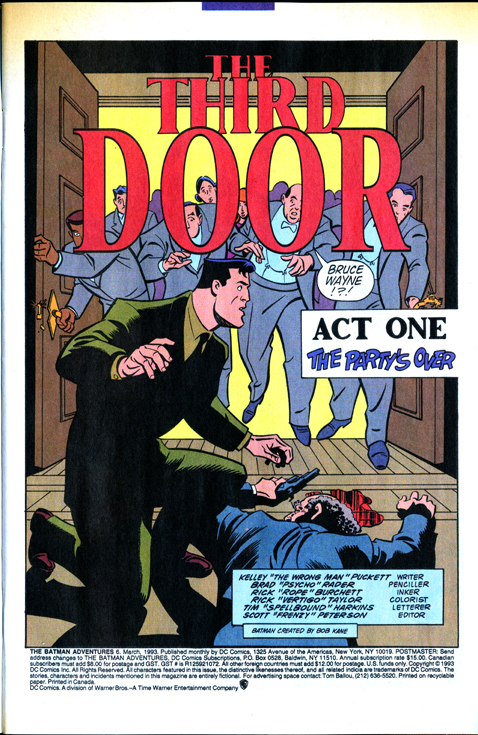 This issue is a pastiche of Alfred Hitchcock movvies, as is telegraphed by the nick names of the various contributors in the credit list. 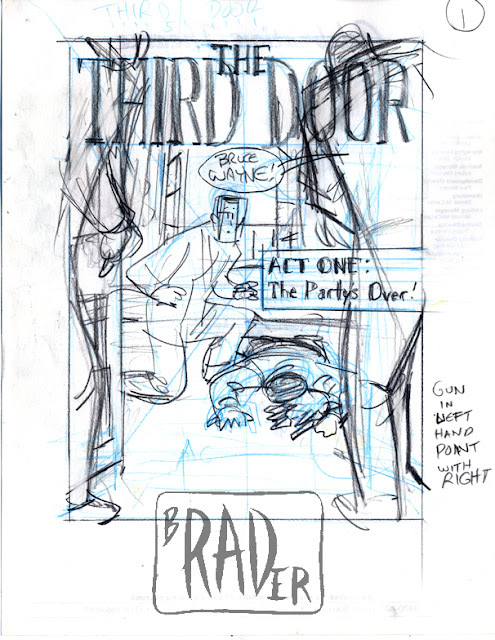 The title is an obvious nod to Carol Reed’s “The Third Man”, not Hitchcock,but navigating similar terrain. At the time, Alfred Hitchcock was one of my favorite filmmakers, and a primary influence. I loved his movies from childhood onwards; it was like a holiday when ever one screened on TV (this was in the days prior to VCRs, and in Anchorage, Alaska, where i grew up, there were no revival theaters). In the late 80’s I discovered “The Murderous Gaze”, a book length collections of critical analysis/ philosophic ruminations by Robin Wood about the meaning of Hitchcock movies. My mind was blown and for the next 10 years I read everything I could find, both by Mr. Wood and about Mr. H. So I leapt at this opportunity to apply his various methods and motifs in a comic book story. I designed two versions of the splash page. I recall the general consensus (between the editor, the writer and myself) that the chosen version was the most “Hitchcockian”. It heightened the “Wrong Man” feel to show a crowd of onlookers, rather that just 2, over the shoulder. I strategized was that it would increase the sense of isolation and alienation for Bruce if we couldn’t see the onlooker’s faces; this is the effect in the rough. Unfortunately, the typography on “Door” is screwed up, in that the vertical elements are too narrow, allowing us to see too much of the on-looker’s faces. 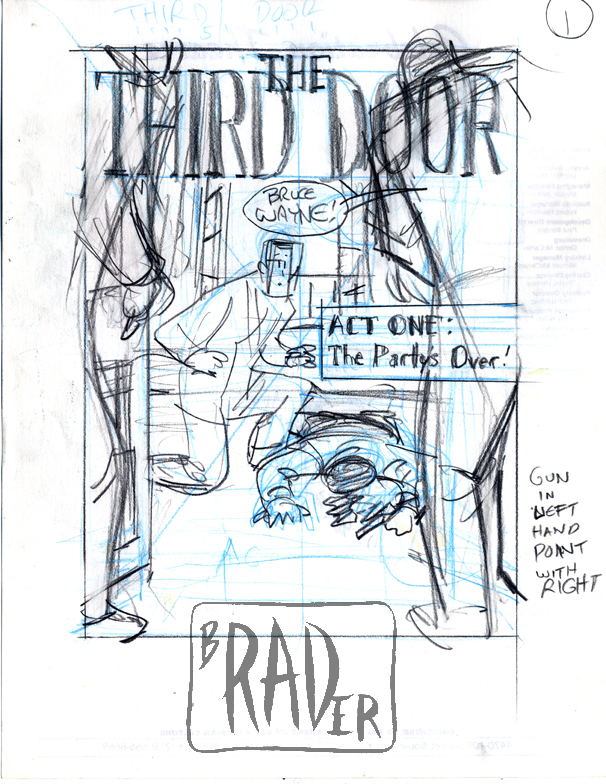 I’m probably to blame, since I pencilled the title lettering. (To know for sure, I’d have to excavate my copies of the pencils.) It is somewhat effective anyway.